(CNN) - In a move with both 2014 and 2016 implications, Texas Gov. 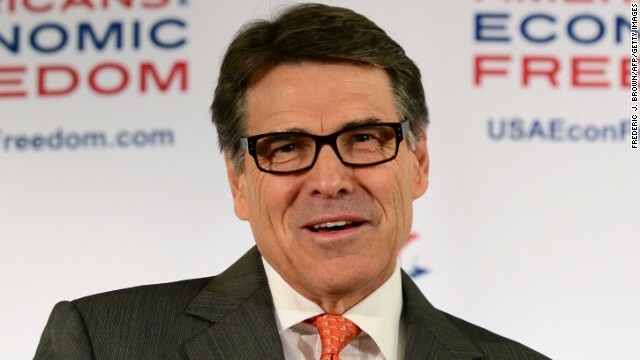 Rick Perry will weigh in Tuesday on the U.S. Senate battle in New Hampshire. The longtime Republican governor from Texas will team up NHGOP Chair Jennifer Horn on a media conference call to criticize both Democratic Sen. Jeanne Shaheen and President Barack Obama over the current border crisis. The 2012 Republican presidential candidate is seriously considering another bid for the GOP nomination in 2016, and New Hampshire plays a crucial role in presidential politics, as it holds the first primary on the road to the White House. Last week Perry announced that Texas would send 1,000 National Guard troops to help secure the southern border, where tens of thousands of unaccompanied minors from Central America have crossed into the United States this year, a surge that's been described as a humanitarian crisis. Perry made his news just a few days after he met with the President in Texas to discuss the situation at the border. The influx of Central American children trying to cross the southern border has been a major media story over the past month and a half. The White House and many Democrats have clashed with Republicans in Congress and governors over who is to blame and what should be done about the crisis. "After six years in office, Jeanne Shaheen and President Obama have failed to secure our border. Now we are seeing the effects of their failed leadership and inaction. If Granite Staters want to secure the border, they need to replace Jeanne Shaheen with a Republican senator in November," said Horn in advance of the call. The call comes one day after Republican Senate candidate Scott Brown went up with a new television commercial that links Shaheen to the President over the border crisis. "Thanks to the pro-amnesty policies of President Obama and Sen. Shaheen, we have an immigration crisis on our hands," Brown says in the ad, which his campaign says it will spend six-figures to run statewide for a week. The former senator from Massachusetts – who last year moved north to New Hampshire – is considered the heavy favorite to win September's GOP Senate nomination and challenge Shaheen in the general election. New Hampshire Democratic Party Communications Director Julie McClain said the "negative ad reeks of desperation," adding that "Scott Brown knows both Jeanne Shaheen and Kelly Ayotte (the state's Republican U.S. senator) voted for a comprehensive immigration reform bill that strongly increases border security." This is the second time in a week that Perry is weighing in on the Granite State race. Last week Perry linked Shaheen to Obama when discussing the border crisis during an appearance on radio host Jack Heath's "New Hampshire Today" program. Immigration policy helped sink the Texas governor's disastrous 2012 presidential bid, but it has now put him back in the spotlight. Perry heads to New Hampshire on August 22-23 to meet with political and business leaders. In May the Texas governor hosted more than a dozen well-connected New Hampshire politicos at a dinner at the governor's mansion in Austin. The timing of Tuesday's media conference call is also interesting because it comes two days before New Jersey Gov. Chris Christie, another potential 2016 GOP White House contender, returns to New Hampshire for a second visit in a month. The Republican Governors Association chairman will help raise money for the state party and for Walt Havenstein, the leading GOP gubernatorial candidate in New Hampshire. Some may speculate that Perry is trying to upstage Christie, in what's become a bit of a rivalry between the two men. Last week, after Christie told New York Republican gubernatorial candidate Rob Astorino that his longshot bid this year against Democratic Gov. Andrew Cuomo was "a lost cause," Perry publicly supported Astorino, and tweeted a picture of himself with his arm around Astorino at an even in Aspen, Colorado. New Hampshire Democrats were quick to attack the Texas governor. "Rick Perry's brand of discrimination isn't welcome in New Hampshire," Democratic Party Chairman Ray Buckley said in a statement. Buckley was referring to Perry's comments from a speech last month when he compared homosexuality to alcoholism. "I may have the genetic coding that I'm inclined to be an alcoholic, but I have the desire not to do that – and I look at the homosexual issue the same way," Perry said at a speech in San Francisco. Perry admitted he fumbled the ball but stood by his comments. "Accepting Rick Perry's endorsement and then touting it in front of members of the New Hampshire media is truly disturbing given Perry's consistent anti-LGBT record," added Buckley. "I feel your pain my sister. They do the same thing when it comes to us. For some reason some of them really believe we're stupid or not as intelligent as they are. Even the PWT's. Go figure. I guess that's why, despite the dysfunctional obstructionists in Congress that President Obama is still getting things done. Not nearly as much as he would with help, but he's still doing it." Some folks are here simply to raise other folks' blood pressure. What is the deal with the gang lately? You guys are rider and more aggressive than ever before. I gotta laugh at your chutzpah tom l.
I think you just want us to reflect the sappy, roll-over, hit-me-and-we-wont'-hit-you-back, lie to us, lie about us crappy Dems in government. THAT'S not going to happen on this site. We are SICK of GOP OBSTRUCTION and will SHOW you in November when the GOP LOSES the house and SENATE. A lot of CANTORS coming in November !!! !